The artichokes of Rome are world-famous and very popular in the Roman cuisine. Unlike the others, they are round and soft, and more importantly, they have no spines. 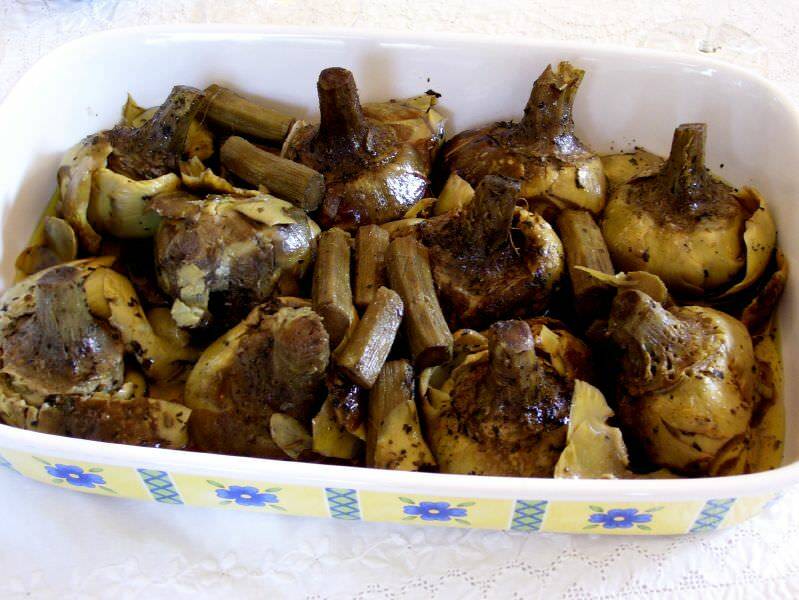 Thanks to this, they are entirely edible and this is why they are the only variety that can be used for the two following recipes: Carciofi alla romana (Roman-style Artichokes) and Carciofi alla giudia (Jewish-style Artichokes). These two succulent artichoke recipes, which are considered appetizers or side dishes, might look the same at first sight as both are whole fried Roman artichokes. However, they are cooked in two different ways and you can definitely notice it when you try them both. This typical Roman-Jewish dish is an antique recipe that was born in the Rome Jewish Ghetto around the 16th century. 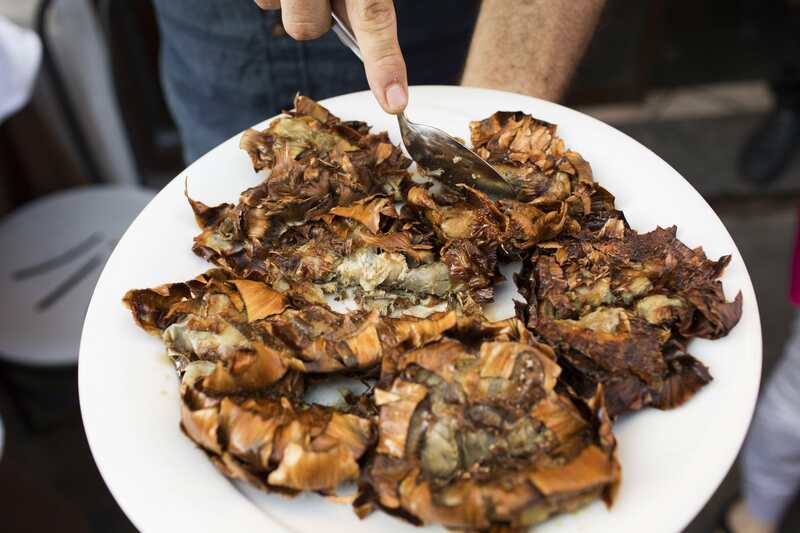 At that time, people used to eat fried artichokes to break fast but it has become so popular that it is now served year-round in many Roman restaurants and especially in the Ghetto. To start, you must remove with a knife the hard outer leaves as well as the reddish part of every single leaf. Your artichoke will get the shape of a round rose. At this point, you can peel off the outer skin part of the stem. Fill up a bucket with water and lemon juice and immerse the artichokes inside for 10 minutes. Drain the artichokes and dry them, then beat them upside down against each other so the leaves open. Heat the oil to 140-150°C (280-300°F) then immerse the artichokes for 10-15 minutes. They must not become too soft. Put them upside down on a tray and start opening each leaf with a fork, from the inside to the outside. The artichokes will now have the shape of a fully bloomed rose. Season with salt and pepper, and leave to rest for a few minutes. Heat the oil a little more and immerse the artichokes again, for 1-2 minutes only. Finally, transfer them to paper towels to drain and … enjoy them! This recipe, slightly different from the previous one, is also an integral part of the Lazio culinary tradition. Thanks to only 3 additional ingredients, Romans added a lot of value to this “dish of the poor”. Clean the artichokes and put them in a bucket filled with water and lemon juice like for the Jewish-style recipe. Meantime, clean and mince the parsley, Roman mint and garlic. Put in a bowl and mix with 2 table spoons of oil, then add some salt and pepper. Slightly open the artichoke leaves in order to insert the aromatic mix in-between leaves. Place them upside down in a heavy-bottomed pot and add a cup of oil and a little bit of water, then slowly cook with the lid for about 25 minutes. The Roman-style artichokes are ready! Arancini are not Supplì with super powers!